Description: Adorable little 4.5" Miniature Doll, all bisque. She is not signed. This doll was purchased at a local auction and we are unable to date the item. She is complete, still strung well with wire. We have not attempted to "fix" her by cleaning her soiled clothing, we leave that to the buyer to decide how cleaning or repairs will be made. Her clothing is pretty soiled and delicate. She wears a handmade lace dress, an eyelet slip, bloomers made of a rough muslin type fabric, and she has a lace and silk ribbon cape, the ribbon on her cape is deteriorating. She wears cute blue shoes and her socks are textured in the bisque. It looks like someone over time may have tried to add paint to her features, however, we are not sure of that, it may all be original. Please look closely at the photos of her face. 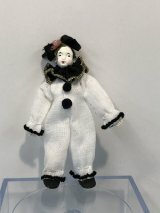 This is a precious little one who is looking to be adopted into the treasury of a loving doll collector who will value its cuteness and longevity. Condition: Very good condition overall except for soiled clothing, she shows signs of her antique or near-antique age. No breakage. This doll comes with no box or stand.